Shelled Insulator Pants were partly inspired by late-season steelheading in northern B.C., where stretching the season often means chopping through river ice, this is the shelled, weather-resistant and warmer version of our toasty Insulator Pants. Long sessions in wet, cold conditions? Perfect. They are also perfect for sledding, shoveling, stacking wood and more (like for post surf and kite boarding sessions). Warm, low-bulk Re gulator® R1® fleece (98% polyester that’s 62% recycled/2% spandex) and a soft-but-tough 3-ply Supplex® nylon shell with a DWR (durable water repellent) finish team up to keep you warm under waders. 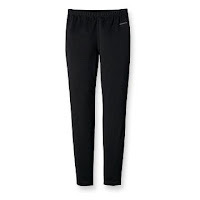 Features include an elasticized waist with drawcord, two lined front pockets, a zippered horizontal rear pocket and gusseted cuffs with a hook-and-loop adjustment. The R1® fleece lining is partially attached at the waist, inseam and outseam to stabilize it. Shell: 3-ply, 3.8-oz 70-denier Supplex nylon with a DWR (durable water repellent) finish. 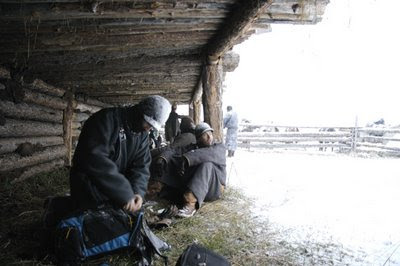 Top photo by Brian Jill - The AEG crew finds shelter from the storm in a partially enclosed horse stable somewhere in Mongolia. This is really great news, as my old grey Insulator Pants are finally due for a replacement, or at least a few other pairs to join in. 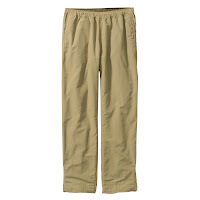 These have been my "Go To" pants once the water gets cold and I pretty much live in them for weeks at a time. I had thought they were discontinued some time ago and never thought to look again. These are a must have for late fall and winter steelhead anglers.